Traditional Chinese medicine (TCM) practitioners claim shedding pounds without sweating a drop or skipping a meal might not be as easy as popping a pill but could be as simple as enduring a few pinpricks. 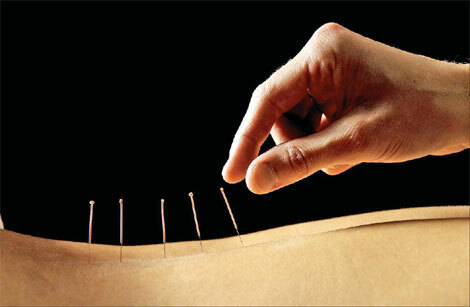 Some claim acupuncture's health benefits extend beyond leaner bodies, too. Beijing resident Feng Lin says she's sold on the idea. The 24-year-old publishing house editor says she lost 3.5 kg between early July and mid-August after receiving acupuncture at Beijing Massage Hospital's consultation clinic. And she claims she has kept the weight off, despite having to give up the treatments because her job requires her to travel often. "The therapy has reduced the intensity and frequency of hunger fits," she says. It's very different from her dieting regimens, which were difficult to sustain because she "always had a good appetite" and would quickly regain any weight she had lost when she quit. "Now, I have healthy eating habits that don't require any effort," Feng says. And her severe dysmenorrheal (menstrual pain) has faded, too, she says. 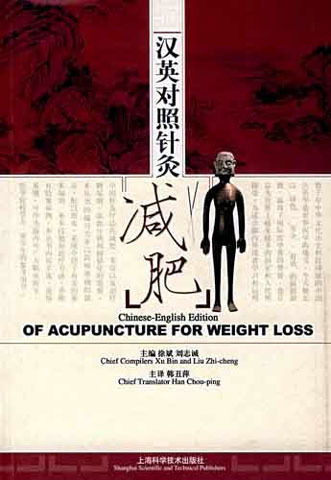 TCM treatments for obesity and overweight physiques include acupuncture, catgut embedment, massage and herbal medicines, the special consultation clinic's vice-director Wang Zheng says. Weight loss treatments employ the same strategy as those that fight illnesses - that is, by helping the body achieve a balanced state that enables all organs to operate in a harmonized way to allow the body to naturally maintain health and beauty, Wang explains. Acupuncture, catgut embedment and massages stimulate certain acupuncture points to mend jingluo, or meridians, which are paths through which the life-energy known as "qixue" is believed to flow. These three treatments are most effective for people with endocrine disorders or excessive weight. Herbal medicines are better for those who have greater and more complicated weight problems, Wang says. Chen Luquan, with the TCM and acupuncture department of Beijing's Tongren Hospital, puts it this way: "Jingluo function as pipes that deliver energy to every part of the body, and acupuncture points are like valves. When the acupuncture points are stimulated, it is like the valves are readjusted to function more effectively, improving the energy flow." The philosophy represents the TCM consensus, but practitioners sometimes disagree on acupuncture points' locations. But the concept of treating weight issues with TCM is to stimulate those points responsible for metabolism and the endocrine system. An improved metabolism burns fat, while many diets instead rid the body of water. If the treatments can adjust appetites, then patients will eat only as much as they should. But convenience, rather than effectiveness, might be TCM weight treatments' real trump card. A typical regimen calls for acupuncture and massage three to seven times a week for the first two weeks, and two to four times a week afterward. Catgut embedment enables stimulation of acupuncture points outside of the clinic and requires fewer visits from patients - two to four a month. The injection of animal intestine strips stimulates the points as the body absorbs them. "It's not practical for me to diet, because I often dine out with friends and clients," Wang Jianhua, a road construction contractor in Beijing, says. "But getting catgut injections two or three times a month is easy." She recently resumed her catgut therapy after a two-year hiatus. Wang first tried the therapy at Beijing's Tongren Hospital in early 2009, and was thrilled when her weight dropped from 90 kg to 60 kg in six months. Wang had been overweight since childhood, when she received hormone treatments to treat pneumonia. "It seldom occurred to me that I needed to lose weight," she recalls. She gained more weight in 2004, when she took more hormone treatments for optic neuritis (an inflammation of the optic nerve that affects sight) and suffered from irregular menstruation. It was then that she decided to lose weight. "It's about health more than appearance," she says. Her doctor, Chen Luquan, advised her to try catgut therapy, because she was busy with work and traveled often. "The result was magical," Wang says. "It totally exceeded my expectations." She menstruated normally and her sleep improved, she says. Chen says TCM treatments are "green" solutions to weight problems. "They have no side effects and can make people healthier," Chen says. "But people should not suddenly stop their treatments." Abruptly halting TCM therapies can disrupt the metabolic normalization that comes with organ function harmonization, Chen says. "And after treatments end, healthy diets and exercise are important to stay healthy."